Learn how to make no bake quick and easy cake balls recipe. 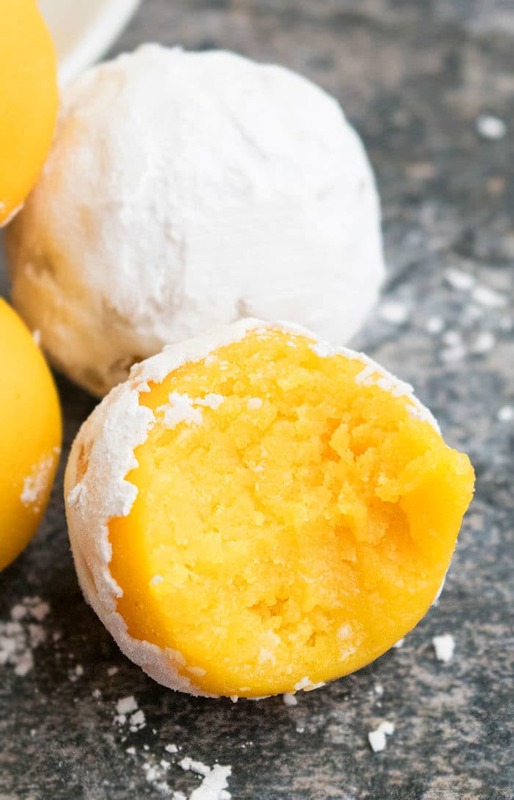 These fudgy, creamy, homemade lemon cake truffles are made with cake mix and other simple ingredients. They are a delicious bite-sized dessert for birthday parties, especially during the Summer. Kids are adults, both, love them! What is the difference between cake truffles, cake balls and cake pops? Balls and cake truffles are essentially the same thing. 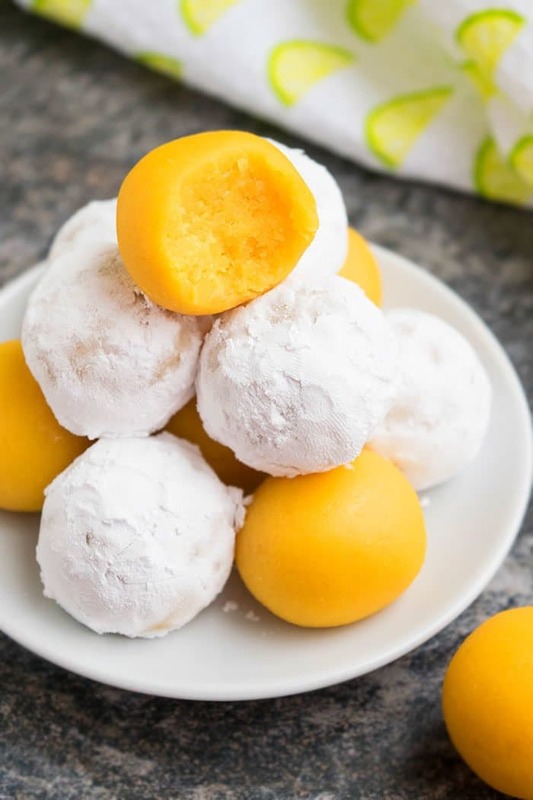 They are bite-sized balls that can be made with raw cake mix and cream cheese OR they can be made from scratch with leftover cake crumbs/ cake scraps and frosting. After mixing everything together into a thick dough and shaping into small ball shapes, they are dipped in chocolate or rolled in powdered sugar. Cake Pops, on the other hand, are this same cake ball recipe on a a stick and they are always dipped in chocolate to secure them properly. How to make cake balls and cake truffles? Mix together cake mix and powdered sugar. Roll in powdered sugar and you are done. Can you use icing to coat cake pops? No, it can be added to the cake crumbs to make the mixture moist to roll into balls but it will not coat the balls evenly or smoothly. Coating should always be done with melted chocolate. Can you freeze cake truffles? Yes, you can freeze them for up to a month in sealed freezer bags, as long as you don’t dip them in melted chocolate first. Dip them in chocolate after they thaw. Use full fat cream cheese– Because it leads to a richer texture and flavor. Chill the dough or mixture in the fridge for 30 minutes- Do this only if the dough is too soft and difficult to form into balls. What to do if mixture if crumbly? Add milk (a little at a time), until it is easy to roll into balls. Mixture should be smooth- For best texture, make sure to mix together the ingredients properly so there are no lumps. Coating options– Once you have rolled small balls, you can coat them in melted chocolate (white, semisweet or dark) or even cover them in sprinkles, shredded coconut, chopped nuts, mini chocolate chips or chocolate shavings. Try some add-ins- Such as mini chocolate chips, shredded coconut or chopped nuts. The sky is the limit here. Cream cheese substitution- I highly recommend cream cheese because it cuts the sweetness and gives a subtle tangy flavor. However, you can also use my best no fail best Cream Cheese Frosting Recipe. Is raw cake mix and raw flour safe? While the risks associated with raw flour and raw cake mix are low, you can take extra precaution by spreading the flour or cake mix powder on a cookie tray and baking for 5 minutes at 350° F. This won’t affect the flavor and you can rest easy. Use other flavors of cake mixes- Have fun and try chocolate cake mix, or carrot cake or funfetti or even Gingerbread for Christmas holidays. Learn how to make no bake quick and easy cake balls recipe. 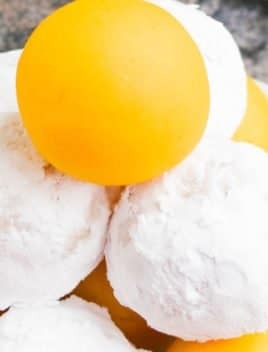 These homemade lemon cake truffles with cake mix and other simple ingredients are fudgy, creamy! In a large mixing bowl, add cake mix powder, powdered sugar, cream cheese and mix until you have a ball of dough. Tip: If dough is too crumbly, add a little milk to make it easier to handle. Scoop out small portions of the dough and form little balls. 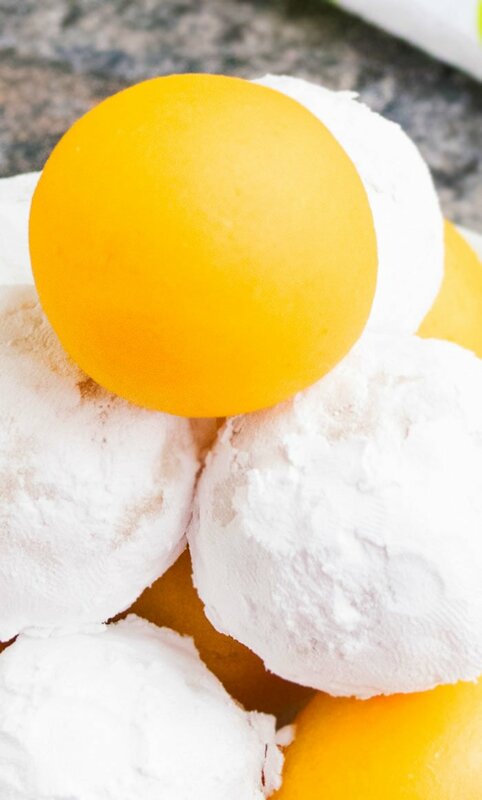 Roll them in powdered sugar and enjoy. Tips: Instead of using powdered sugar, you can dip in melted chocolate. Prior to dipping them, chill these ball in the freezer for about 30 minutes so they are firm and don’t fall apart. The number of truffles you get from this recipe will depend on how big or small you roll your balls.